We're headed to Orlando once again and are excited that our PDQ Waterford location is set for its Grand Opening party on Sunday, February 17. 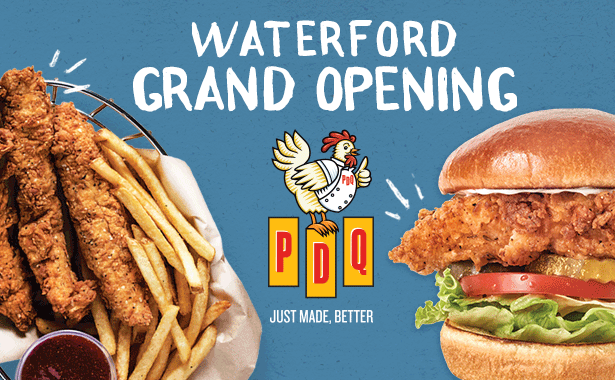 Our Waterford location will feature all of our PDQ classics like hand-breaded chicken tenders, homemade sauces, made-to-order sandwiches, delicious fresh salads, and hand-spun milkshakes. We'll be open for lunch and dinner seven days a week for dine-in or take-out, as well as drive-thru or catering. The Grand Opening party festivities will include our First 50 lineup, with your chance to win free PDQ and more. The first 50 guests in line on Opening Day will receive a $50 PDQ Gift Card, lunch on us and a PDQ swag bag. See below for the official rules and deets. UCF Students can also join in on the fun. The first 50 UCF Students with a valid ID can stop by the restaurant between 2pm and 3pm for a free meal and a PDQ T-shirt. Stop by any time during Grand Opening day to receive a scratch off card with any purchase for free PDQ, along with a chance to win a $50 gift card, and enter a raffle for a chance to win PDQ grand prize baskets. Check out our Waterford Grand Opening Facebook Event for more details. Our newest location is located at 12195 East Colonial Drive in Orlando and is open 7 days a week from 10:30 am - 10 pm. We look forward to seeing everyone soon! As one of our “First 50” Guests in line on Grand Opening Day, Sunday, February 17th, each guest will receive a special PDQ numbered lanyard denoting your place in line. The “First 50” Guests will get $50 in PDQ Gift Cards, a Swag Bag filled with awesome prizes and one Free Combo Meal on Opening Day. The lanyards will be distributed by the PDQ Marketing Team upon their arrival on Sunday morning. All guests who receive a lanyard will not be permitted to leave the premises, and will forfeit their spot in line by doing so. Doors open at 10:30 AM or before. The free combo meal can be redeemed for the following items: 3-Piece Tenders Meal (with side and 20 oz. Beverage), 8-Piece Nuggets Meal (with side and 20 oz. Beverage), Sandwich Meal (with side and 20 oz. Beverage), Bowl with 20 oz. beverage OR Salad with 20 oz. Beverage. The available sides for the free meal are French Fries, Tots, Apple Slices with Toffee Dip, Broccoli and Chile-Lime Corn.